I'm making a small departure from my normal reviews today for a couple of reasons, primarily because I like this publisher and because the took an idea I was working on and in many ways made it better. I figure the money spent on this item at Drive Thru RPG is worth the time it saved me. I'll admit I'm a fan of Inked Adventure's offerings and own most of their stuff. The skillful combination of hand-drawn art and gridded, modular rooms really appeals to me. 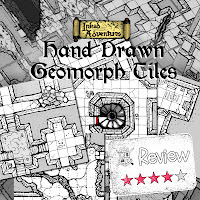 Inked Adventure's Hand Drawn Geomorph Tiles continues in this same vein. The tiles are a bit on the small side, at 8cm a tile, six tiles per sheet. Altogether the set has 120 tiles spread out over 21 sheets. Realistically though the set is only 60 tiles as every tile is mirrored to produce another usable tile. Some might see this as a bit of an artist cop-out, but I think it is a really good idea. If you think that doubling the offering by mirroring tiles is a cop-out, then simply evaluate this set's values based on 60 tiles. Each tile is 10 squares by 10 squares, with entrances on squares 2 and 8 on each side. This lets you "shift" the tiles so they offset for some more variation in dungeon layout. Since there isn't a specified scale, each tile can be 625 sq. feet (5' squares) or 2500 sq. feet (10'squares). 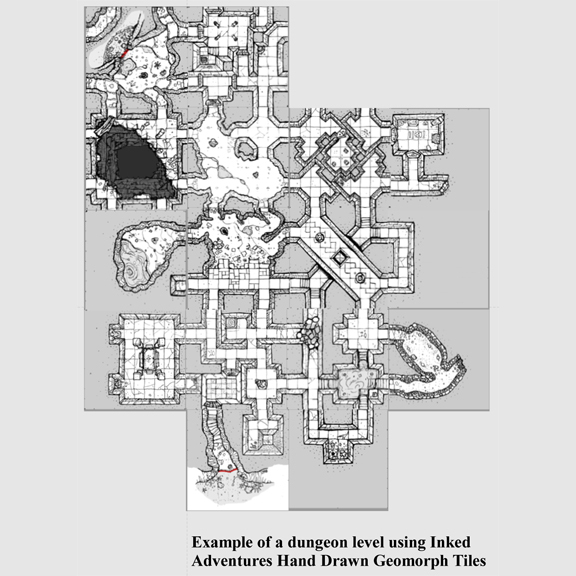 The artist, Billiam Babble, makes a good comment that traditionally dungeon geomorphs were used as GM aids and just a representation of the dungeon, not intended as actual maps for in-game use. While it is a good point, I have to take exception to this approach because the tiles look so nice. As a GM I like to have nice things, but I want nice things I can use. If this was just an aid to help me randomly lay out a dungeon that I had to draw out or make myself, then I don't need this level of detail and the tiles are way too big. Shrink them down to maybe an inch or two across at best. This would let me mount them to foam core and treat like actual tiles. If the tiles were available as jpgs then they could be used with virtual table tops as well. It is important to note that you could easily still do this by changing the print options! On the flip side, I have to do a lot more work to blow these things up to use at the game table with the players. I'd love to have each tile as a full size workable battle mat. This would work if you went with 8x8 tiles instead of 10x10. I'd have been ok if the tiles were just made available as individual tiled jpgs so the GM could easily manipulate them how they wished. I will give Billiam some props for including the tiles sized for US and A4 sheets and adding in additional file with GM note pages....again in both US and A4 formats. 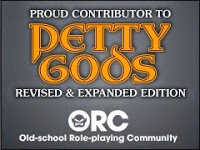 These were awesome touches that really help make it easier for a GM to use the product. Overall I wish these tiles were tweaked a bit to accommodate more styles of play, but they are still great tiles that offer a nice homemade touch to what is usually a rather rough-looking GM aid.